Decades ago, after reading a lot of “self-help” psychological literature, I concluded that much of the advice it offered could be condensed into a single key principle, which I summarized as: You are what you dwell upon. Recently, I read news of a fascinating study that appears to confirm this truth in an unusual way. It suggests that when we “lose ourselves” in the world of a fictional hero, we actually may be on the path to personal change. What is denigrated too often as hero-worship may not be an adolescent neurosis at all, but an important, even essential, component of self-improvement. One of their most intriguing findings however, was that “Experience-taking doesn’t happen all the time. It only occurs when people are able, in a sense, to forget about themselves and their own self-concept and self-identity while reading,” [research leader Geoff] Kaufman said. In one experiment, for example, the researchers found that most college students were unable to undergo experience-taking if they were reading in a cubicle with a mirror. We all know, introspectively, the inspirational power of fiction, but this study appears to provide empirical confirmation of it. I found their experiment with the mirror particularly intriguing, as a window on how reading fiction may facilitate actual personal change. Perhaps we must lose ourselves by entering the world of — and walking in the shoes of — some model character, before we can “replace” our current self with a new and better one. If so, then what is denigrated too often as hero-worship may not be an adolescent neurosis at all, but an important, even essential, component of self-improvement. Growing up in a dying mill town in western Pennsylvania was an oppressive experience. And in our blue-collar home, there were few windows that opened to a world of wider possibilities. That wasn’t my parents’ fault. Their lives had been brutally tough, their own horizons painfully limited. My dad was born on a nearby farm and never made it to high school. For many years, he worked with his hands — stone mason, soldier in WWII, carpenter, railroad brakeman. Mom never finished school, either. She displayed early signs of musical talent, but there was no money for piano lessons. She spent her young adulthood on the assembly line at the “the pottery” — the local china factory. After the war, they met, married, and settled in a tiny ranch house. Later, they bought and ran a local tavern, to help put my brother and me through college. They worked like mules; there was little time for anything else. So, culture was an unknown. There were no books in our house. We didn’t go to plays or concerts. The local radio stations featured farm reports and Patsy Cline. Like most parents of that generation, they desperately wanted their kids to have more than they did, so they valued education. But the local offerings were limited. Each morning, I rode an old yellow bus with bad shocks to a school where the biggest club was the Future Farmers of America. I was eternally lucky that the school had a quirky librarian with political passions, an art teacher who played classical recordings during class, and an unforgettable history teacher who opened my mind to the world of ideas. I can’t tell you how important such experiences were to a lonely little kid with a big imagination, growing up in that four-room ranch house. But the cultural inspiration of my youth came from the TV action heroes of the 1950s. As a toddler, I became addicted to TV. Mom would park me in my little walker in front of our massive Philco. She told me that somehow I figured out when my favorite shows would come on, and I would scoot the whole walker forward to change the channels. That small screen introduced me to the concept of vigilante heroes — appropriately, in black and white. My earliest imprinted images of manhood included the Lone Ranger, Roy Rogers, Robin Hood, the Range Rider, Hopalong Cassidy, Wyatt Earp, “Lash” LaRue, “Cheyenne,” and Tarzan. There was a Saturday serial cliffhanger featuring the adventures of an amazing guy with a “jet pack” on his back, “Commando Cody.” Meanwhile, Walt Disney’s Mickey Mouse Club served up a regular diet of Zorro and Davy Crockett. And then there was Superman. Boy, did I love Superman. Later, I discovered other comic-book heroes — vigilantes all. There was Batman (still my favorite), the Flash, the Green Lantern, Aquaman, the Phantom, and Spider-Man. Novels — especially science fiction and action thrillers — came along later, during adolescence. I can’t tell you how important such experiences were to a lonely little kid with a big imagination, growing up in that four-room ranch house. Those heroes told me that life didn’t have to be a series of boring, empty routines. That there was more to the world than the claustrophobic rural township where I grew up. That the universe was a huge place filled with adventure and romance, open to infinite, exciting possibilities. But, most importantly, that you always had to stand up for justice. Like millions of other kids from that era, I took all this very seriously. In college, I fell in love with the heroic action thrillers of writers like Alistair MacLean, Mickey Spillane, Desmond Bagley, Donald Hamilton, and Don Pendleton. My current favorites include Lee Child, Stephen Hunter, Robert Crais, Brad Thor, Vince Flynn, Jack Higgins, Nelson DeMille, and Robert B. Parker. Significantly, most of their stories feature lone-wolf, “vigilante”-type heroes. Of all genres of popular fiction, action thrillers are my favorite, because they present an extravagant, open-ended, no-limits vision of human potential. Just as TV, film, and comic-book heroes can spark passion and idealism in children, thrillers can keep the fires of that passion and idealism burning in adults — at least, in those adults who have not surrendered to cynicism. 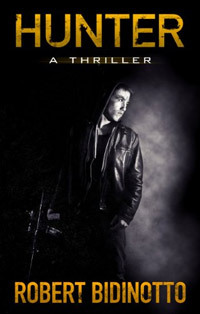 In 2011, I wrote and published my own debut novel, HUNTER: A Thriller, which went on to become a national bestseller. It is the first in a projected series of fast-paced, romantic crime thrillers that dramatize individualist philosophical perspectives on controversial current issues. But more importantly, I created its tough-guy hero — a “philosophical vigilante” named Dylan Lee Hunter — to be an idealized model of individualist values. Those who know me from nearly half a century of writing nonfiction about politics and philosophy may wonder: Why have I rebooted my career to become a thriller writer? Some may believe it’s a step down: that “philosophical” writing is far more important and has much greater impact on the world — assuming that is my primary goal. Art is the indispensable medium for the communication of a moral ideal. Even so, some might dismiss the thriller genre, specifically, as the literary equivalent of junk food. How could such “popular escapism” impart important ideals to readers? Well, as far as escapism goes, all works of fiction — including those with literary pretensions — transport the reader into imaginary worlds. Certainly, a mental journey into an imaginary world can offer a few hours’ reprieve from boring routines and unhappiness, if such happens to be your chronic state. Call that an escape, if you will. However, for the ambitious soul, fiction offers more than an escape: It provides road maps and fuel to set out on one’s own real-life journey to a different, better place. And, as the Ohio State study appears to confirm, it can provide the morally ambitious soul with even more: the inspiration, insights, and examples to become a different, better person. For the ambitious soul, fiction offers more than an escape: It provides road maps and fuel to set out on one’s own real-life journey to a different, better place. It also implies the critical importance of what we choose each day to feed to our souls — not only in terms of art, but also in terms of experiences and personal associations. Excuse-makers who minimize personal responsibility may claim that a person who does something bad was “influenced by his peers.” But we choose the influential company that we keep. Likewise, we also choose the influential company that we keep when we pick up a novel or watch a film. If “you are what you dwell upon,” then what should you choose to dwell upon? Those who craft heroic, visionary fiction present us models of what individuals should aspire to become. During challenging times, in life and in history, what work could possibly be more important, or intellectually meaningful, than that? A long-time author of nonfiction books, essays, and reviews, Robert Bidinotto is author of HUNTER, which became the number-one Kindle bestseller in “Mysteries and Thrillers” and a Wall Street Journal “Top Ten Fiction Ebook.” HUNTER is available at Amazon.com in print and in a Kindle ebook edition. It is also available in a new audiobook edition from Audible.com, from Amazon.com, and from iTunes. Bidinotto currently is at work on the second in the Dylan Hunter thriller series, BAD DEEDS. You can follow him on his blog, “The Vigilante Author,” and on Facebook. Robert Bidinotto's thoughtful column makes me think about just how many fictional (and even real) heroes could be regarded as vigilantes. If we define a vigilante as someone who uses force outside the law, then Howard Roark is a vigilante. The strikers in Atlas Shrugged are vigilantes (especially Ragnar). In real life, you could say the Founding Fathers were vigilantes. I realize that I'm stretching the concept a bit, but isn't the attraction of the vigilante that he does right even though society is against him? Of course, not all heroes are vigilantes. Don Walling in Executive Suite doesn't break the law. Neither does John Washington in The Chaneysville Incident. In real life Steve Jobs didn't break the law, although he did break the rules. There is, of course, room for both types of heroes in anyone's universe. Glad you found my column thought-provoking. I've actually addressed the issue of vigilantism in a number of posts on my blog, "The Vigilante Author." You're right, of course, about the eternal appeal of the vigilante character: He is someone committed to justice when the normal institutions of law and justice become corrupt, or break down. That's why my own vigilante thriller, HUNTER, has been so popular: It's hero is committed to justice in precisely such circumstances. In fact, I wrote a piece about this topic -- which also makes clear why I don't endorse vigilantism (as opposed to self-defense) in real-life situations, unless there is a total breakdown of the legal system and there is no other recourse. You might find it offers further food for thought. Hi! Thank you for writing about the role of heroes in your childhood. I loved those books and those comic book superheroes. They affected me deeply at the time. I am pleased to see that you have framed those experiences as ones that could possibly contribute to the development of our ethics and our character. At this time in our history, our culture so desperately needs an emphasis on the heroic - in all its forms. Absolutely agree with that, Scott. Thanks. I have to wonder how much effect Robert A. Heinlein has had on American men, particularly by way of the "boys' books" he'd published almost annually with Scribners from 1947 through 1958. An individual who has adopted even a few of Heinlein's standards of thought and conduct would, I think, make not only a quite respectable human being but also a stubborn opponent against any kind of authoritarian one might care to name. Tich, thanks for bringing up Robert Heinlein -- my absolutely favorite sci-fi author. I'm not a big fan of that genre anymore, but as a kid I read a lot of it, and Heinlein was far and away at the top of my list. Thank you for this article. It allowed me to figure out a great mystery that has puzzled me for years. I am a strong, independent woman who is very much her own person. However, growing up in the 60s - the only role models for women that I had in my family were secondary to the men, held few opinions of their own, and played helpless more often than not. That was their default mode where as mine is to take charge and try to land the plane. I never knew where I got this from until I read your article. Ilsa, your experience is not isolated. Those Nancy Drew stories inspired millions of young girls to become more self-assertive, independent, and confident -- and to strive to realize their dreams. Young boys of those generations past had Tom Swift and the Hardy Boys, role models of intelligence, courage, intellectual curiosity, and creativity. And there also was the good-vs.-evil moral code in their stories. In an age of morally bankrupt and rootless kids, we need such exemplars more than ever. Thanks for sharing your story. Fictional heroes can be inspirational to me. I love books and movies in which a hero with an outlook of enlightened self-interest battles a villain who is a twisted sado-masochist. Of course the hero should win because of his correct outlook and the villain should lose because of his incorrect outlook. Thanks for the article, Robert. Got your book on audible, looking forward to reading it. Joshua, I hope you enjoy the audio edition. For me, it was quite a different experience from reading the print or ebook edition, because the story is filtered through the mind of a narrator. But let me know what you think. Hello Robert, I enjoyed your article about vigilante heroes. I am familiar with many of the same ones you mentioned. In fact, I once did an Atlasphere article about Don Pendleton's Executioner series. But you forgot to mention, Paladin from "Have Gun, will Travel". It was my favorite Western. Paladin was a gunfighter .... with ethics. Although he was not a law officer, he always restored Justice. Further, it's interesting to note that the Pioneer-era version of vigilantism in history is Not the negative thing hollywood has sometimes portrayed it as being. Unlike yourself, I would endorse vigilantism but only for extreme and extenuating circumstances. I was pleased to see your "Hunter" book advertised online. I am currently waiting for it's delivery. I'm sure I would enjoy a philosophical version of such a story. The vigilante character is such a familiar fictional icon that any list would necessarily leave out popular characters. Paladin should of course be on any such list. Many of the heroes of TV and film Westerns belong there. You can look at other cultures: Samurai warriors were Japanese versions of medieval "knights errant." The timeless popularity of such fantasy characters speaks volumes about the timeless injustices that ordinary people have had to endure -- often perpetrated by the governments, rulers, and legal systems that are supposed to protect them. For the vigilante stands for justice, even above or outside of the law. And I don't absolutely rule out vigilantism in "extreme or extenuating circumstances" -- such as a complete breakdown of the justice system in a given area, or its perversion into a system whose predominant purpose is to inflict injustice. Finally, thanks for purchasing HUNTER. Please drop me a note when you finish it and let me know what you think of it. Robert, thanks for sharing some of your early life. I think I understand The Vigilante Author a bit better. I hope so, Michael. Thanks much. I enjoyed the characters in Atlas Shrugged but I don't considered any of them vigilantes. When I began reading the Bob Lee Swagger novels by Stephen Hunter-I, Sniper (Bob Lee Swagger Novels) by Stephen Hunter (Sep 21, 2010) that his character is a quasi-vigilante and a individualist. I'm not ex-military, but became interested when I got my Conceal Carry License and started practicing with a firearm. My attitude changed significantly with respect to firearms. So, I have read most of Stephen Hunter's novels and have enjoyed his main character. I will probably never get to that level of proficiency. My confidence in myself has grown considerably. So, fiction in this case has changed my character. Ah... another example of (your groups name here) echo chamber. I joined the libertarian party in 1978. I was an acquaintance of Dave Nolan. Well, maybe more than an acquaintance since he is the reason that I have a 22 year old son. that "success" lead me to more research and writing and to xfoolnature.org. Now consider this: Võ Nguyên Giáp defeated the French (no small feat), and the US, the largest power on the planet. How did he do that? I have some ideas, but you need to educate yourselves. You can claim that it was because "bad people" "betrayed us". That of course begs the question. How did he get bad people to do this? Is our military riddled with bad people? Was Cronkite a bad person? The fact is that Giap won. Wayne Root on the ticket, we seldom get more than one vote in 200. All that Koch money bought us all of 700K votes. Well Let me make two observations. The first thing that libertarians need to do is to stop thinking that people are like them, and at least begin to accept people as they are. To paraphrase Sun Tzu. If you do not understand the nature of the problem you are very unlikely to successfully resolve it. Giap understood the nature of his problem. A word on Heinline. Almost all of his novels are based on this premisees. All problems are caused by a small group of bad people X, and can be fixed by killing them. Good people are like me. I am an irresistable chick magnet.